WHITTIER — When combat medic Jose G. Ramos returned home from the Vietnam War, the decorated Army veteran was wracked with guilt over the men he could not save. Already smoking pot, he turned to cocaine to keep him awake when the nightmares worsened. Then he started drinking heavily. Ulti­mately, he didn’t care whether he lived or died. Today, as the founder of the Wel­come Home Vietnam Veterans Day project, Ramos has dedicated his life to ensuring that no veteran feels alone or helpless again. In 2009, Ramos’ lobbying efforts paid off when then-Gov. Arnold Schwarzenegger signed a bill pro­claiming “Welcome Home Vietnam Veterans Day” at the Twentynine Palms Marine Base. Soon after, many other states adopted similar legislation. And many credit Ramos’ efforts in helping influence President Bar­ack Obama’s decision earlier this year to declare Vietnam Veterans Day on March 29, the date the last American combat forces withdrew. Rep. Linda Sanchez, D-Cerritos, said meeting and talking to Ramos a decade ago is what inspired her to begin her work honoring Vietnam veterans. She said it convinced her that she should do all she could to pass a “Welcome Home Vietnam Veterans Day” in Congress. 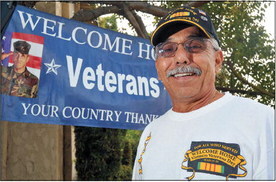 Ramos, a retired physician’s assistant, also serves on Sanchez’s Veterans Advi­sory Council. “I would bet that Jose’s tireless efforts were one of the many com­pelling stories that influenced the President’s decision to make the presidential proclamation of a Viet­nam Veterans Day this year,” Sanchez said in a written state­ment. In 2004, the nonprofit’s cycling team rode across country to Wash­ington, D.C., and in January 2008, Ramos conducted a three-day solo vigil in front of the White House. The nonprofit also holds an annual celebration at California High School in Whittier for veter­ans of all wars. The first WHVVD event, held in 2008, attracted some 3,000 veterans and community members, he said. Ramos also helps connect veter­ans in need of a range of services, including transportation, housing, health and mental health services. In the ’70s, I was part of a Dept. of Labor/Private Sector funded program, called the Jobs for Veterans Program of the National Alliance of Business was formed for Vietnam Vets, to help with Employment Development, PTSD counselling, Rap groups, Viet Vet image and Job Search Workshops and was the prototype for the Vet Centers and DVOP Programs. When Ronald Reagan came in, our program funding was stopped. I hope that the VA will now expand services like ours, as the Vets of today need these services as the Viet Vets of yor still do. i’m looking for a Jose Ramos that had a brother Ernesto Ramos who was a WW2 veteran born in Arizona . i am tracing my past CA roots.